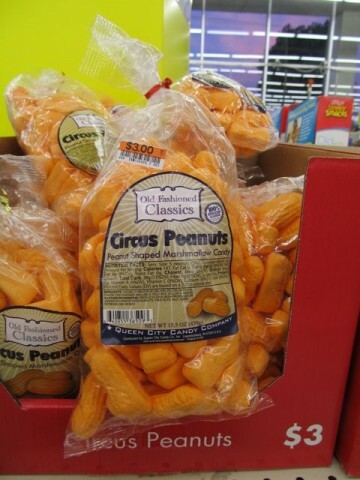 Big Lots Presents Circus Peanuts! SO I was in my local Big Lots the other day looking for a set of bed sheets that had been bought by someone else, opened, possibly used but not washed, returned, haphazardly repackaged with an excess of clear packing tape, and placed back on the shelf at the same price the last person paid for them. Oh boy! 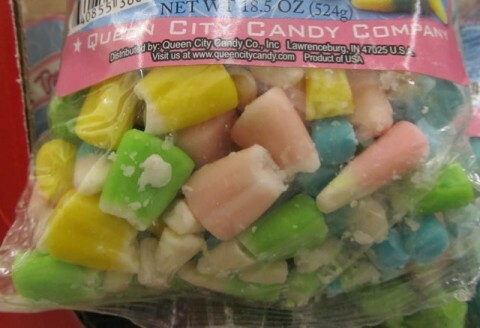 Nearly a pound of the candy everybody hates, at only twice the price you’d pay for them anywhere else, if you’d ever buy them – which you wouldn’t. And Big Lots, a discount store, expects us to pay $3 for 15.5 ounces of these things and then be pleased with ourselves as though we got some sort of deal? Well, here’s a deal for you: Don’t buy them! 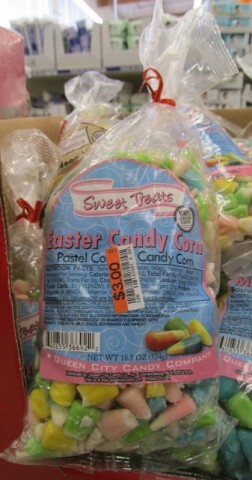 Don’t buy them and instead put that $3 to good use with the purchase of an 18.5 ounce bag of their delicious vintage 2011 Easter candy corn! Can we get a close-up of the bottom of the bag? Yep, here comes that sauerkraut. Posted by Ted on March 1, 2012, 4:33 AM.